Our mission is to advocate for quality cancer care for all people touched by cancer. NCCS has worked with legislators and policy makers to represent cancer patients and survivors in efforts to improve their quality of care and quality of life after diagnosis. Our unique niche in the cancer advocacy landscape is promoting policy change to ensure quality cancer care. Our vision is to be an advocacy organization that reflects the needs of all cancer survivors to effect policy change at the national level. 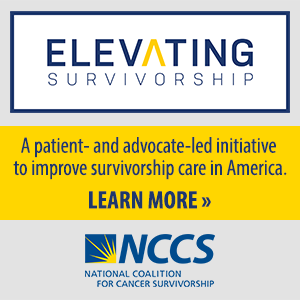 NCCS represents the millions of Americans who share a common experience – the survivorship experience – living with, through and beyond a cancer diagnosis. That experience has value and can be a transforming, positive force. NCCS also knows that cancer survivors and those who care for them face many challenges. Advocates for changes in how the nation researches, regulates, finances and delivers quality cancer care. Empowers cancer survivors through its publications and programs, which provide tools for self-advocacy. Convenes other cancer organizations to address nationwide public policy issues affecting cancer survivors.